In late 2015, Christie Digital Systems began redesigning its customer showroom in New York City. The company was specifically looking for a solution that allowed them to showcase and demonstrate its direct view LED displays in an appealing way to customers, dealers, and partners. 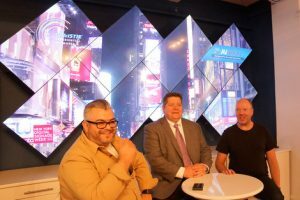 Thanks to Christie Experiential Network’s Executive Vice President, Global Media, Kevin Romano we used the studio here for ‘AVNation Live from the CEN Studios’ which took place Wednesday October 26, 2016 during New York Digital Signage Week, Ed. Located in a small facility that operates Christie’s digital advertising network, Christie’s project had specific requirements, namely, the company wanted to fit as much technology in the space as possible. With limited space and the uneven structures that NYC is notorious for, Christie’s technology selections were crucial. Christie needed a way to soundly install an LED video wall that offered the flexibility of allowing easy access to the backs of displays for demonstration and service, while also maintaining a clean design to showcase the different display pixel pitches. After the due diligence of much research, Christie selected Peerless-AV for the project. A major piece of this selection was due to Christie’s withstanding relationship with Peerless-AV. Peerless-AV had many times over proven it not only makes excellent products, but also addresses challenges correctly, always delivering on set goals and thoroughly assessing projects to find solutions that work. Moreover, Peerless-AV’s solution fit the tight parameters of this project. For the project, Peerless-AV developed a custom Direct View LED Pivot Mount to hold the Christie Velvet Merit series display in a 7×5 configuration. Due to the high weight of the mount and LED displays (1,000 lbs. in total), and the fact that the wall structure was still to be determined prior to installation, the mount was designed to transfer as much of the load to the floor as possible. To do this, Peerless-AV designed a wall plate that attached to the four studs, as well as the floor. Peerless-AV also placed heavy-duty shock absorbing casters to support the load as the video wall pivoted open and closed. The pivoting feature was necessary to provide rear service access to the LED display. Located in an older Manhattan office building, Christie’s office caused numerous concerns and challenges, including working around existing items, the weight that the walls could bear, and the unevenness of the floors. As the location for the installation was a demo facility, Christie was also concerned about the costs associated with the project. The structural frame of the custom Direct View LED Pivot Mount arrived in four easy to assemble sections. This allowed the mount to be delivered through the elevator system of the older building. Additionally, the LED adapters on the mount provided depth adjustment, which meant the installer was able to quickly and easily ensure that the video wall was straight and plumb. Beyond the structure of the wall mount, installation of LED displays is a common challenge in itself. First, the LED pixels are extremely delicate. Further, to showcase its line of displays, Christie’s wall mount would need to incorporate displays of different pixel pitches. Ensuring the wall appeared even despite varied depths of the LED displays was a must. Peerless-AV began installation in October 2016 and in total, the installation took three days to complete – as a result, Christie’s NYC showroom now showcases 35 LED displays in a 7×5 configuration. The custom solution has improved the servicing of the displays and increased sales for Christie. The mount has been able to meet Christie’s needs for showcasing its varied line of displays, with the ability to feature five different pixel pitch solutions (columns 1-3 = 1.5mm pixel pitch, column 4 = 1.9mm pixel pitch, column 5 = 2.5mm pixel pitch, column 6 = 3.0mm pixel pitch, column 7 = 4.0mm pixel pitch). While LED displays can be confusing to many, the video wall set-up allows Christie to easily educate its customers on these types of displays. Peerless-AV, a Peerless Industries, Inc. company, is a leading designer, manufacturer and distributor of audiovisual solutions. From its award-winning mounts and wireless audio systems to indoor/outdoor kiosks and the industry’s first fully sealed outdoor displays, Peerless-AV has aimed to fulfill both integrators’ needs for ease of installation and service, and end-users’ dreams in residential and commercial applications for the last 75 years. Based in Aurora, IL, Peerless-AV manufactures over 3,600 products that serve original equipment manufacturers, commercial integrators and consumer retailers in 22 vertical markets through direct sales representatives and authorized distribution. This entry was posted on Friday, February 24th, 2017 at 06:56 @330 and is filed under DailyDOOH Update. You can follow any responses to this entry through the RSS 2.0 feed. You can leave a response, or trackback from your own site.